Former Tour de France champion Jan Ullrich retired from cycling Monday amid continuing investigations of his alleged role in a Spanish doping scandal. The 33-year-old German, who won the Tour in 1997 and was runner-up five times to Lance Armstrong, said he will stay in the sport as a consultant for the Austrian-based Volksbank team. "I am ending my active career," Ullrich said. He criticized the way he had been treated by cycling officials in Germany and Switzerland and by the German media. "I feel like a serious criminal although I have nothing to reproach myself," he said. Ullrich said he was still fit and had received offers from seven teams to race this season, but had decided to move on. Ullrich has been under investigation for several months in Spain's "Operation Puerto" scandal, but has not been charged. He has been without a team since being fired by the T-Mobile team last summer. "I could have had a team immediately," Ullrich told a news conference, accompanied by his wife and mother. "I had offers, also from Pro Tour teams." The Spanish probe followed a raid by Spanish authorities last April on a Madrid clinic which allegedly provided performance enhancing drugs to 57 top riders. The investigation led to Ullrich, a pre-race favorite, being expelled from last year's Tour de France — a day he called the "hardest" in his career. On July 20, he was dismissed by T-Mobile and hasn't raced since. Ullrich said he would work as a media consultant with Volksbank and will also be active in the team's young riders' program. He said Volksbank offered a large budget for other riders that he would bring with him. "That really impressed me," he said. Ullrich trained in the former East Germany and emerged as a top rider in 1996 by finishing second at the Tour de France. The following year he became the first German winner of the Tour, setting off a cycling boom in his homeland. Ullrich also won a gold and silver at the 2000 Olympics in Sydney. Some predicted Ullrich would dominate cycling for years, but Armstrong eclipsed him by winning seven times in a row. Ullrich battled weight problems in the off-season, while his teams publicly accused him of lacking discipline in training compared to Armstrong. 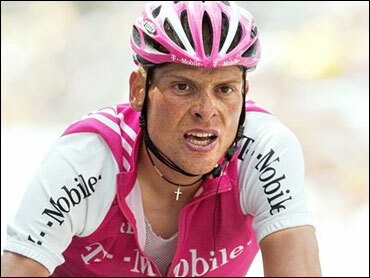 Team Telekom dropped Ullrich in 2002, and he served a six-month ban after a positive test for amphetamines. Ullrich said the drug was laced into an ecstasy pill he took during a visit to a nightclub. Ullrich is also under investigation in Germany and Switzerland. He planned to appear on a German talk show later Monday to talk about the allegations.